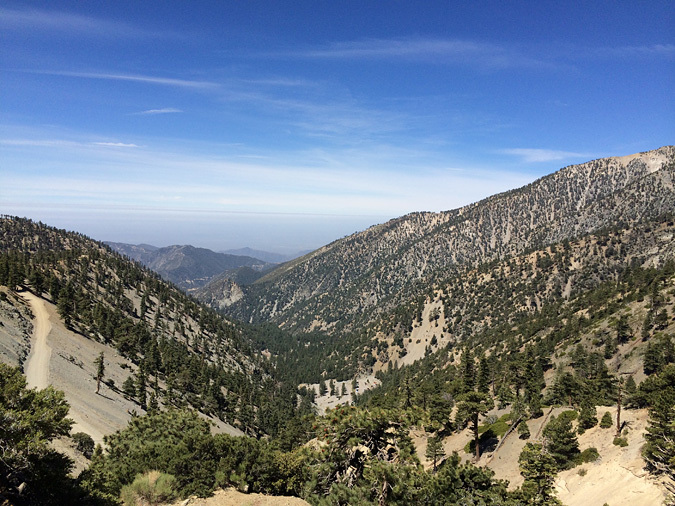 Mt Baldy Summer Hiking | Day Trips L.A.
Mount Baldy, at 10,068 ft, is the highest peak in the San Gabriel Mountains. During the summer, the main ski lift runs on the weekends, taking daytrippers up the mountain to the “Notch”. 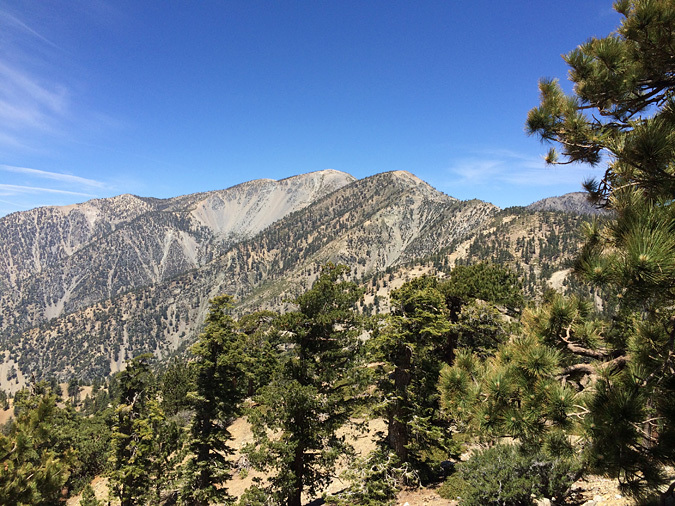 From there, experienced hikers can tackle the steep 3.5-mile hike to the Mt Baldy summit or enjoy an easier 1.5-mile hike to the top of Thunder Mountain. The ski lift up is fun and a bit unnerving if you have little kids with you, the views are amazing, and there’s a lodge at the top of the lift. 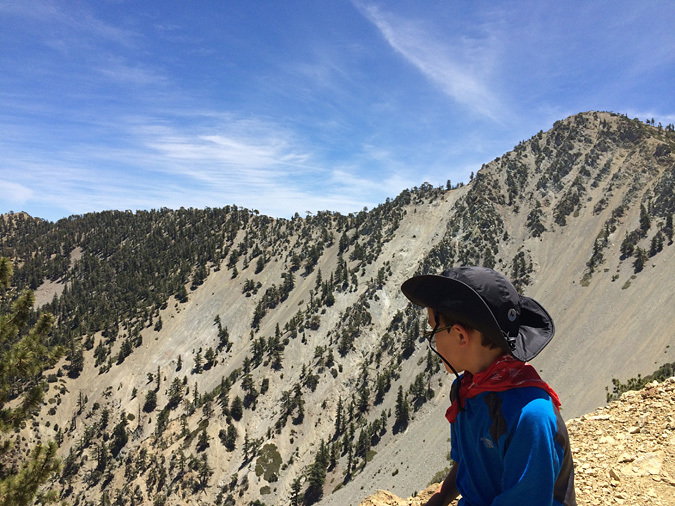 There are many opportunities for day trips from Los Angeles into the mountains, but Mt Baldy might be our favorite. Enzo stopping to take in the view from the Thunder Mountain trail. Cost: Adults $25, kids $15-20. Parking $5. Sketchy ski lift up the mountain, amazing views, moderately challenging hike, great spot for lunch/dinner at end of the day. 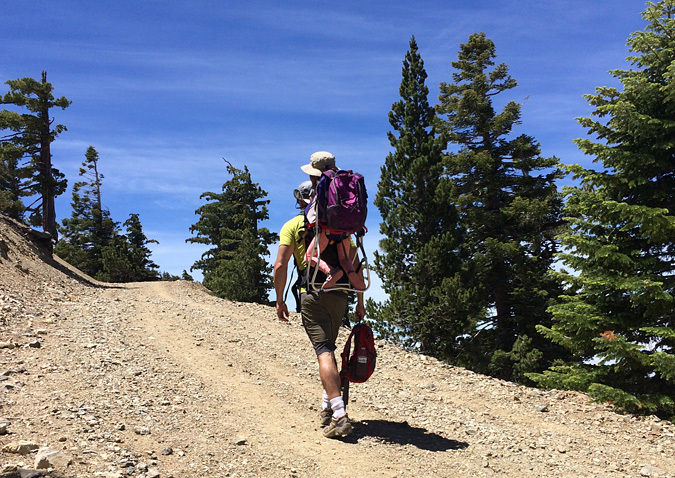 Hiking shoes or sturdy trail running shoes/sneakers, day pack, water, snacks, wide brimmed hat, sunscreen, camera. 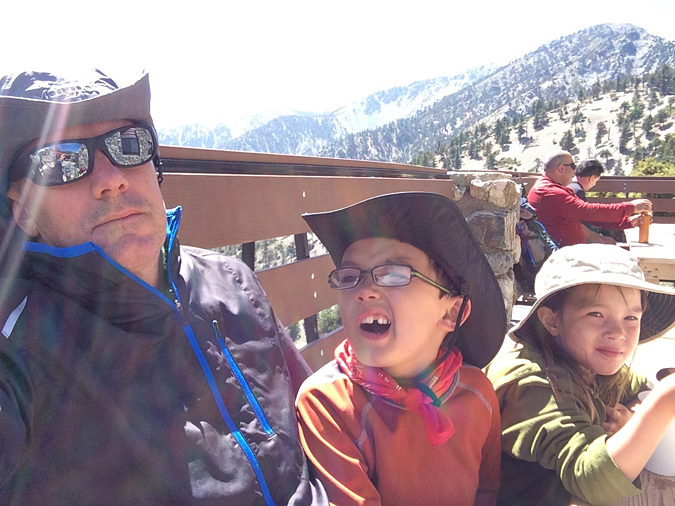 You need a California Adventure Pass to park at the Mt Baldy ski lifts. 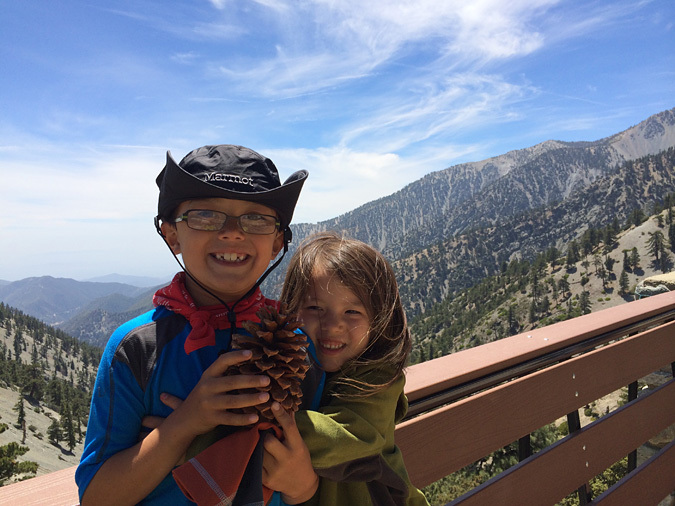 Get one at Sports Chalet or the Mt Baldy Visitor Center. Pack a light jacket for the end of the day. It gets a bit chilly in the late afternoon. If you have small kids, go buy a Kelty child carrier backpack. I have the old Kelty Tour. Forget trying to eat breakfast before you leave the house in the morning. 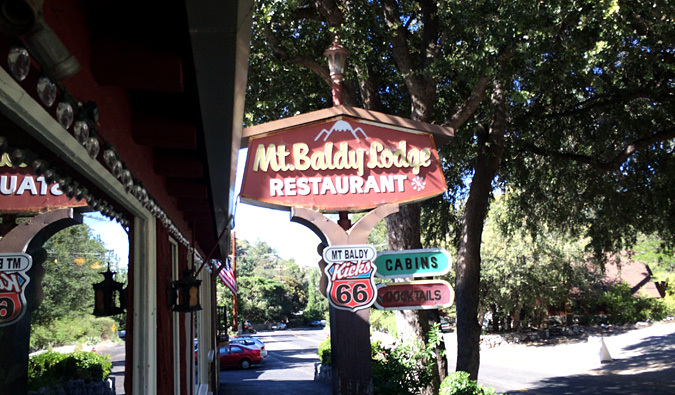 Leave early, and stop in Mt Baldy Village at the Mt Baldy Lodge right across the street from the Mt Baldy Visitor Center. Funky little lodge with giant breakfast portions. And decent coffee. This meal made our day. 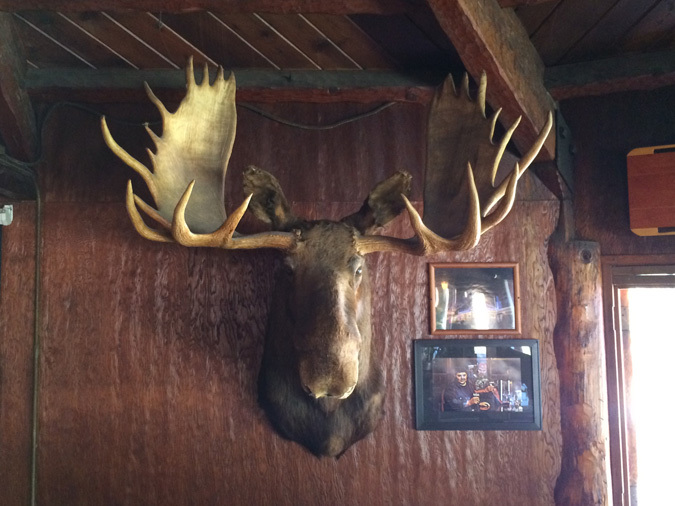 The Lodge also has your last glimpse of wifi for the day, although there is some spotty cell signal on the mountain. Breakfast for three was like $18. 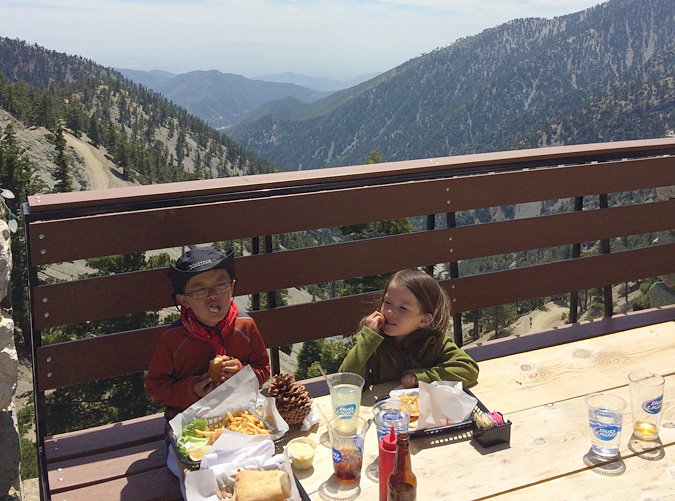 Stop for breakfast at the Mt Baldy Lodge across the street from the Mt Baldy visitor center. It’ll be your last wifi for the day. I’ve confessed my love for goofy visitors centers a few times, but I was so surprised and delighted by this one. When you walk through the door of the little unassuming red building, you step right into a mini-forest diorama-like situation. 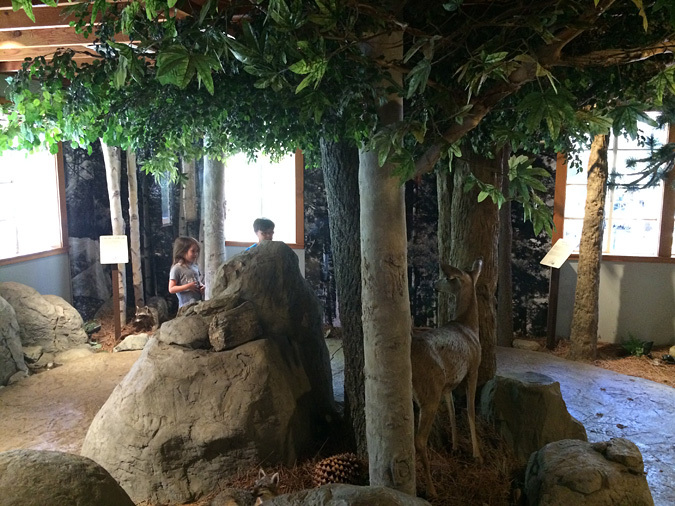 Complete with trees and forest canopy, stuffed critters, and a babbling brook through the room. 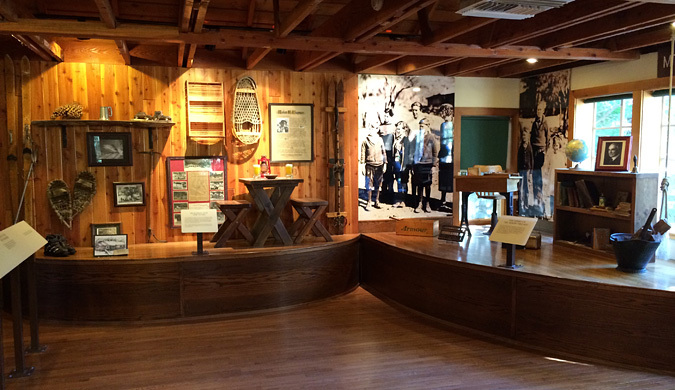 To the right were more displays about the rich history of the Mt Baldy region, and a little gift shop. 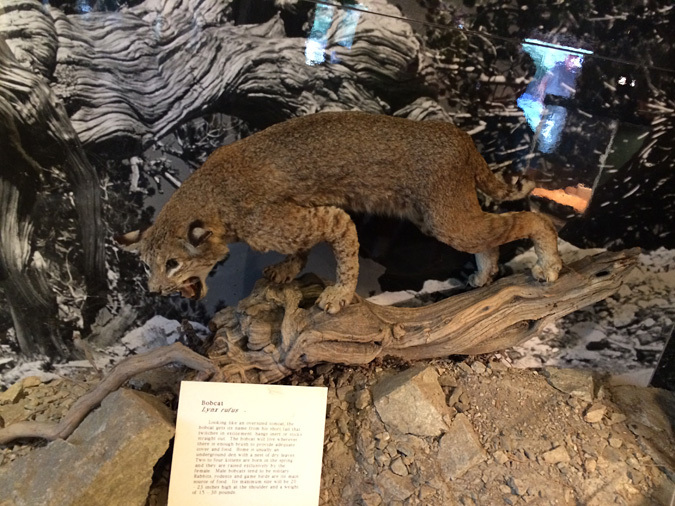 There’s no hurry to race up to the mountain, so take a moment to enjoy this elegant educational treat. You can buy your California Adventure Pass here if you don’t already have one. Be optimistic and get the annual pass! 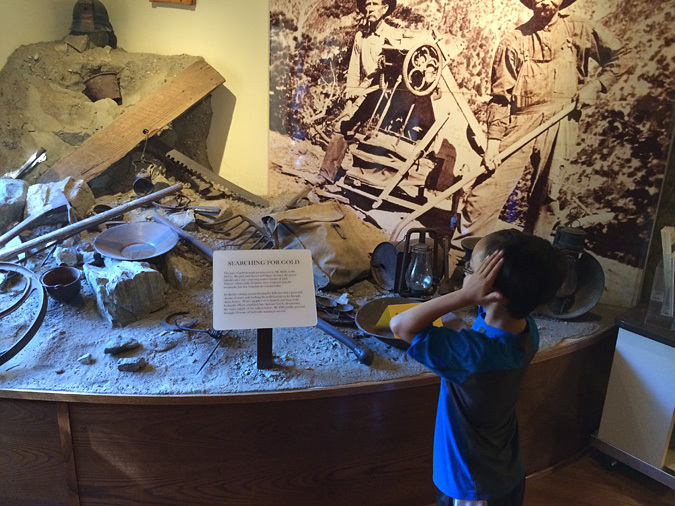 Enzo can’t believe the amazing Mt Baldy visitor center gold mining display. Read any review of skiing at Mt Baldy, and you’ll come across people moaning about the slow rickety old lifts built in the 1950s. While that might be a problem if you’re freezing cold and wanting to get a bunch of ski runs in, it actually is quite fun during the summer. Slowly exciting for the kids, especially when they stop the lift and your little wooden chair with no sides sways back and forth over the abyss. We laughed and joked about falling to our deaths the whole way up. They don’t let kids under 14 yo ride alone. And they weren’t too happy about me having two little ones by myself in one chair. The operators kindly stopped the lift for us to get on, and they threw our day packs on the chair behind us. My daughter sat in my lap, and I kept a tight grip on both of them. Stop and get lift tickets at the trailer near the parking lot. 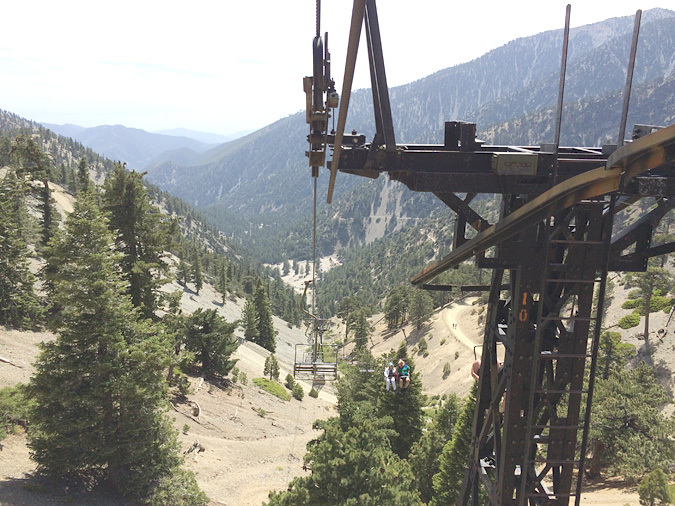 The Mt Baldy ski lift is well-known for being old sketchy and slow, but you won’t be in a hurry anyway. 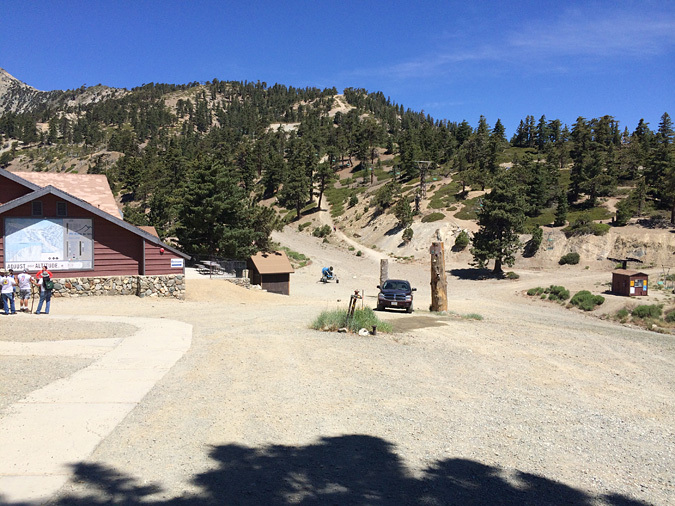 The trail to Thunder Mountain is to the right of the Notch, under the lift by that little shed in the photo on the right. 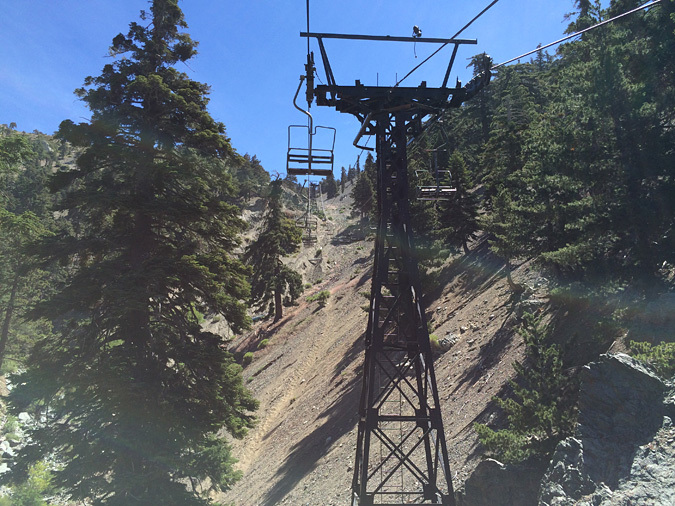 The top of the lift is called The Notch, a low point between two peaks – Mt Baldy and Thunder Mountain. 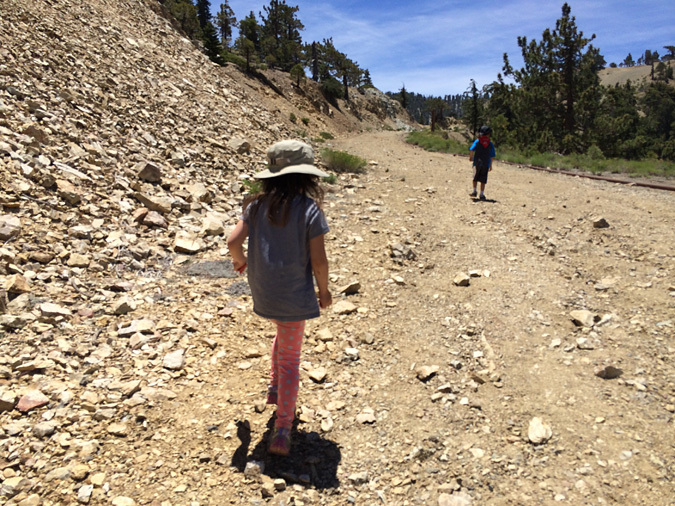 If you have young kids, forget about hiking to the summit of My Baldy. It’s a steep grade and 3.5-mile (one way) hike along a trail called the Devil’s Backbone. Instead head the other direction to the top of Thunder Mountain. 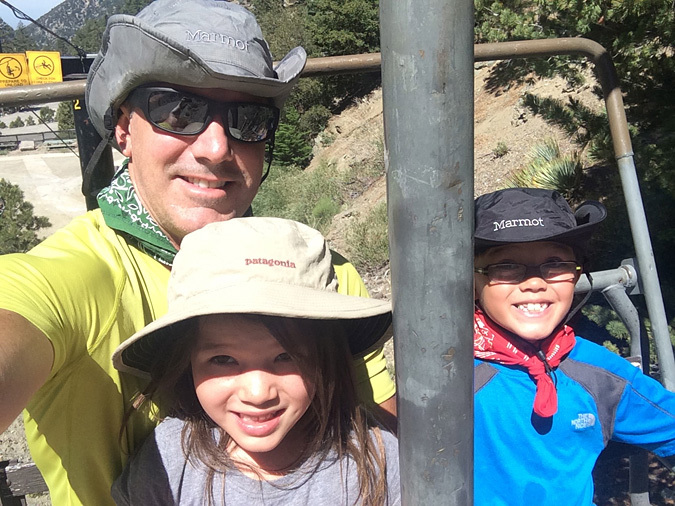 A 1.5 mile (one way), 1,500 elevation gain (from 7,000 to 8,500) along a wide, safe fire road. 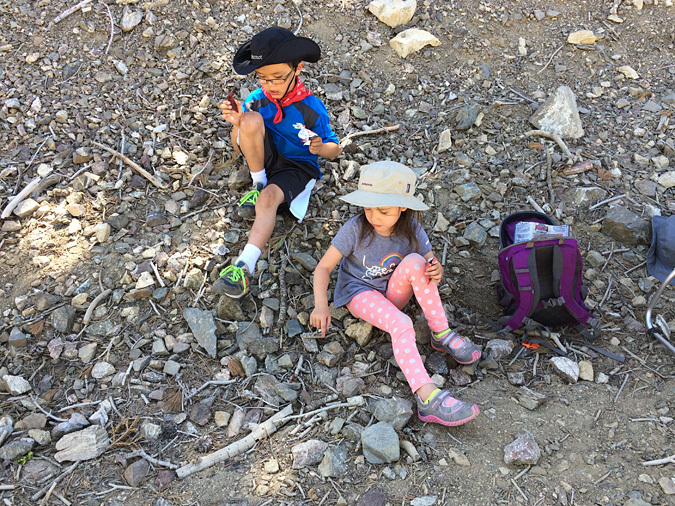 The trail has views in almost all directions and plenty of shaded spots to take rests and snack breaks your kids will beg for. 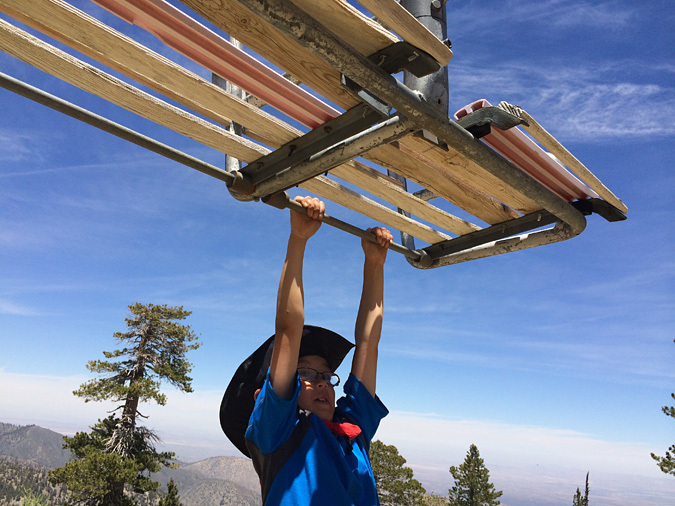 Take your time going up if you’re not used to the altitude, and encourage the kids to conserve their energy. There’s no hurry. Take breaks, enjoy the view. The hike down is easier! Emi actually walked for about 5 minutes on the way up. We stopped for our first 20 minute snack break about 10 minutes into the hike. It took my knees a week to recover from carrying Emi up the mountain. Walking down was easier for my daughter, so she tried it for 10 minutes before I carried her the rest of the way. Despite snacking every 10 minutes on the hike, we stopped at the Top of the Notch ski lodge for a late lunch before heading down. The food is ok and the service is slow but who cares. It is a beautiful spot with a magnificent view. There was live music and lots of friendly people sharing in the experience of being out of the city and doing something great. Waiting for lunch at the Top of Notch. 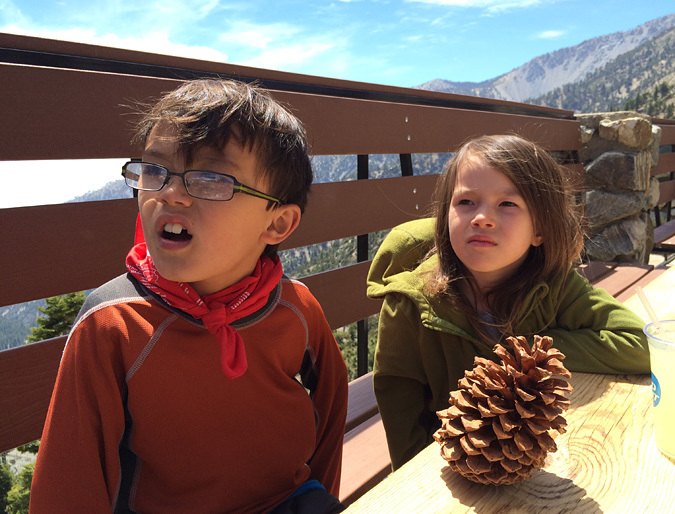 Enzo is holding “Mr Pinecone”, who apparently was whispering secrets of the mountain to the kids all afternoon. I didn’t hear him say anything. The kids were confused by the live music. So was I. Mr Pinecone was totally speechless. Cheer up. So it takes 30 minutes to get a burger, it’s beautiful outside. Lunch at the Top of the Notch was fun, and a little chilly. Bring a light jacket. Two guys hiking down the mountain, beat us to the parking lot. That’s how slow the lift is. You literally can get there faster by walking. Follow your smart phone directions to the Mt Baldy ski lifts (8401 Mt Baldy Rd, Mt Baldy, CA 91759), not just “Mt Baldy”. Or you’ll end up on some dirt road in the hills behind Rancho Cucamonga and be super pissed just like I was. You want to take the 210 East and get off on Mountain Ave. 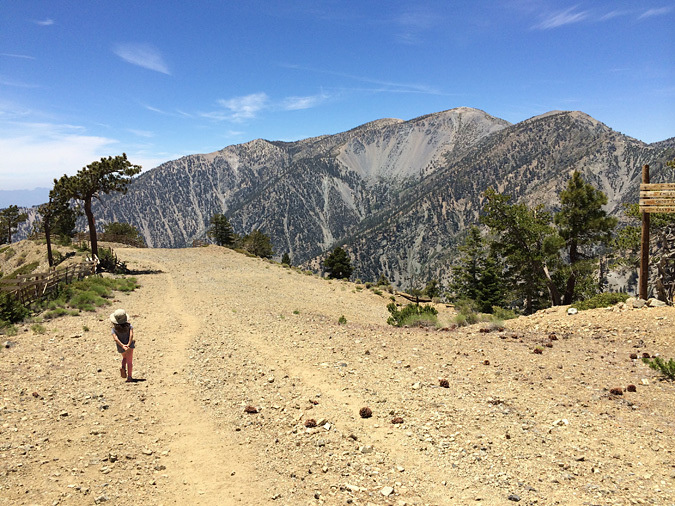 I still don’t know how I missed all the signs to Mt Baldy. Have fun and let me know how it goes! Come back and comment with any tips or suggestions.